Hi Dave, glad to be able to help out, was better than throwing it away. Hi, thanks for the offer, I'd be most happy to hear your proposal. I have a primitive solution that only covers the 'no pedaling, no motor', but not the cutoff at 25 kmh. In Germany, if the cops are not satisfied that the bike meets the pedelec regulations, they can give me a ticket to report to the TÜV (MOT) for a test. With my solution they would very quickly detect the non-conformity. It is very hard to meet the correct pedelec regs., they are basically: 1. No direct motor drive, IOW first pedal then motor. 2. Motor power decreases with increase in speed. 3. Motor cuts off at 25 kmh. Mostly, if points 1 & 3 are met there should be no problem. At worst it would be a light fine, and no loss of the C5. There's a lot more to it that the above. I have a copy of the regs., it's a very good sleeping draught. If the regs. are not met, then the following can happen: Being charged with using an unregistered vehicle. Charged with having no vehicle insurance. Charged for not wearing a helmet. Plus with 90% probability the C5 will be impounded and not returned. Plus, the fines here are quite stiff. There's still a chance I'll use cypax's ULA replacement, or use Dan's touch screen system. That is, once I can read through all the posts and glean the in's and out's of Dan's solution, and see if meets my requirements. Hi David, thanks for the quick reply, much appreciated. Basically, 1. Do away with the motor button. 2. Motor operates only after pedaling. 3. Motor cuts out at 25 kmh. 4. No radical changes to the C5 ccts, i.e. the OS remains in it's original state. 5. No programing involved. Touch screen etc. can come at a later date. I just want to be able to get out onto the road without having to look over my shoulder all of the time. OK!, I could fit some mirrors to solve that problem. My trade was in electronics, but at 73 I'm pushed for time and don't want to waste what's left in learning programing. I was in contact with Phil (cypax), a couple of years ago, concerning his unit, as the software wasn't available. He seemed to be a bit on the cool side, so I dropped the idea. If you have, or can construct, a unit that will fit the requirement listed above, and you are prepared to sell, count me in. I have most of the gear required such as Reed switches, relays, etc. Regards. Karl. Hi David, quite right, but if three or four magnets, or even more, are mounted on the pedal chain wheel, this should reduce the problem. I also have a few brake levers with built in micro switches, these could be integrated into the motor control cct. I would prefer not to use these levers if possible, I only have two sets, and four C5s to convert. Best regards. Karl. Hi David, while on the subject of safety, there's on point I would like to bring up. If there's a single reed switch fitted to the chassis it would be possible to turn the pedals to the activation point and stop pedaling, this would result in the motor being switch on for 100% of the time. This of course contravenes the pedelec regs. Or, if the C5 is pushed backwards the motor could be activated. If two switches are fitted so that at no time the two can be operated simultaneously, see diagram below. 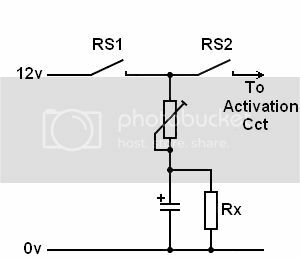 As the pedal turns RS1 closes for a short period partially charging the capacitor then reopens, the pedal rotates further and activates RS2 then deactivates. At no time are both switches in the closed position. After a couple of turns from the pedals, at the right rpm, the capacitor charge is high enough to active the motor cct. I was wondering about that. I closed down at about 1:00 your time, without an insomniac baby. At first I thought you were also a night owl, like me. The reasons for wanting to eliminate the motor button are 1. Having a sore thumb at the end of a long journey. 2. On the left hand side of the handlebars will be a combi-unit with horn button, light switch, and turn indicator switch. On the Right is the switch for the electronic gear change. With the analog system, Rx bleeds the capacitor charge. When the pedal wheel doesn't turn fast enough there isn't the required voltage to trigger the cct. But I must admit it doesn't eliminate the motor from working when one backpedals. Seeing that pushing a C5 backwards fast is a strict no go, then the problem of the motor cutting in is eliminated. I must admit your solution is beginning to whet my appetite. Just one small point, the more magnets the merrier. With the loss of a single magnet you sit high and dry, with the loss of the third magnet things are not quite right, but you can still get home. There is still the problem of the motor operating when you backpedal. It wouldn't worry me, but it might worry the cops. Sorry but I can't edit my last post. 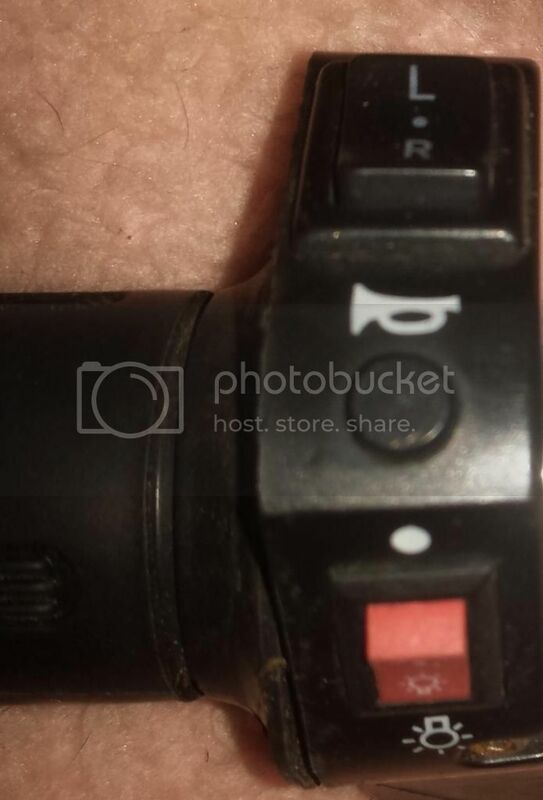 IIRC there is provision for a micro switch on the right hand side of the handlebars (horn button?). Can anyone confirm this? Cheers. Karl. There's something just cropped up in my mind, this dammed pedelec system does not allow for coasting. I must have the power button. I don't think a latching switch would be a good idea. Press the button and the latch operates, now how do you get it to 'unoperate'? The idea is good, and stated the rusty cogs, in my head, turning. The solution would be a solid state flip-flop relay, press once on, press again off. Solid state has the advantage of eliminating the contact bounce. While on the subject of solid state relays, it might be an advantage to replace the existing power relay with a solid state one. There's something just cropped up in my mind, this dammed pedelec system does not allow for coasting. I must have the power button. I don't think a latching switch would be a good idea. Press the button and the latch operates, now how do you get it to 'unoperate'? If it's a latching switch, just press it again, and it will unlatch? The idea is good, and stated the rusty cogs, in my head, turning. The solution would be a solid state flip-flop relay, press once on, press again off. Solid state has the advantage of eliminating the contact bounce. While on the subject of solid state relays, it might be an advantage to replace the existing power relay with a solid state one. I'll leave the power button up to you. As I said I'm open to any ideas, and as I have no idea concerning microprocessors, I appreciate any help I can get. PWM at 12v is worthless, too much voltage loss though the controller. With 24v and a 12v motor the loss is not noticed, but the motor does not receive the full 24v. It appears that microprocessor terminology has altered from the original electronic terminology. Even today a latching switch cct has two buttons, one to latch and a second to unlatch, often used to control electric motors. http://www.dummies.com/Section/id-DUMMIES2_CONTENT_SEARCH_RESULT.html?query=what-is-a-latch-circuit A flip-flop, or bistable switch cct uses one button, first press on, second press off. http://www.dummies.com/how-to/content/digital-electronics-what-is-a-flipflop.html Hence my confusion when you mentioned a latch switch. Hi David, as you quoted. You are quite right, I not keen, I'm just sat here on hot coals, and hounding the computer around the flat, beating the hell out of the poor thing because there's no emails. At the price you quoted, what the hell if it don't work, but I hope to hell it does. Please go ahead, just attach the lead to my collar, and I'll follow. :-" Cheers. Karl. P,S, It looks like your post count has stuck at 6, it's been like that for some time now. Just lead me down the path Phred, oops sorry, David. [blush] I thought it might be a good idea to open the subject under 'Sinclair C5 Projects' so that other members from this side of the ditch can follow the progress. Will make contact as you suggested, and we'll take it from there. Cheers. Karl. P.S. See you're still stuck at 6 posts.